When it comes to hair care products, Herbal Essences has always stood out as a brand and has it’s rightful place in our collection of shampoo and conditioners. 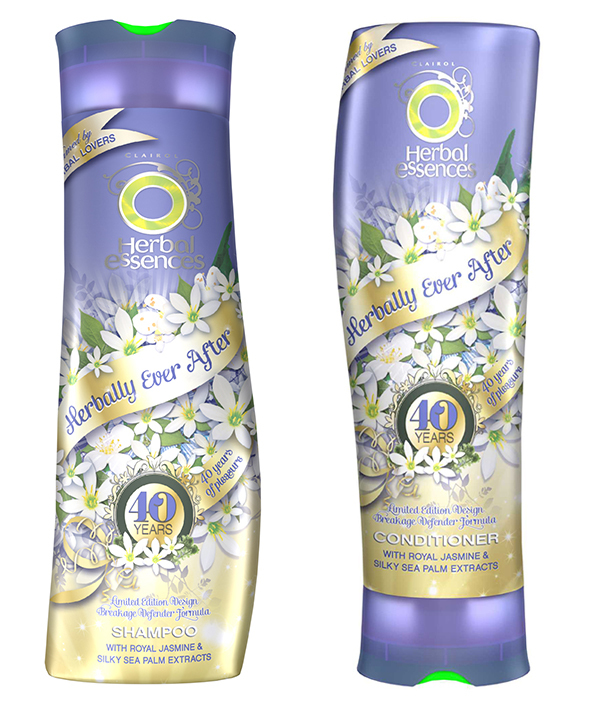 Recently Herbal Essences has just celebrated their 40th Birthday and to celebrate, have launched a new shampoo and conditioner range named Herbally Ever After. The new range features Royal Jasmine and Silky Sea Palm extracts to keep your hair looking soft and silky. Herbal Essences are known for their interesting choices of fruit and herbal extracts in their haircare range and it got us thinking about our experiences over the years with their wide range of products. Of course you'll all remember the Yes, Yes, Yes campaign but a range which definitely stood out to us personally was the Rainforest Flowers collection. We would buy these in bulk just to make sure we wouldn’t run out anytime soon, especially the red bottle! Using the products would always result in compliments and we’d never get tired of the amazing scents. We admire they’ve grown as a brand and changes were made over they years but we love that they’ve still stayed true to their roots and continue to make wonderfully scented products we love. We’d love to know about your memories of Herbal Essences and if you leave us a comment on this blog post before the 13th of March using the Disqus comment widget with your experience of the brand, you’ll have a chance to win some amazing prizes! We hope you all enter, we’d love for one of our readers to win! 1. Open to all residents in the UK aged 18 years or over only, excluding employees of Procter & Gamble UK and its affiliates or agents, the families of such employees and any other person connected with this promotion. 6. After the closing date the winner will be chosen by a panel of judges including Ben Cooke and an independent adjudicator based on the best comment. Winners will be notified via the blog within 14 days of the closing date and they have 7 days from date of notification to confirm their win and provide details of their name and address, otherwise the promoter reserves the right to select an alternative prize winner. 7. The 2nd and 3rd prizes will be delivered within 28 days of prize claim being received. 8. Winners may be required to take part in reasonable publicity associated with the promotion. 9. There is no cash alternative in whole or in part. 10. The Promoter will not be liable for entries not received, incomplete, delayed or damaged. 11. Promoter reserves right to provide prizes of equal or greater value if prize is unavailable for any reason.